If you’re not using influencer marketing in 2018, you’d better have a good reason. The recent stats showed that 92% of marketers who used influencer marketing in 2017 found it to be effective and 39% of them planned to increase their influencer marketing budget this year. Today we can see that they’ve kept their word. Influencer marketing is becoming one of the most popular marketing strategies, which means that companies cannot afford to miss this tactic. It also means that influencers are extremely busy these days, so it’s becoming more and more challenging to reach them. In this post, I’m going to share five hacks (mostly related to content marketing) to unobtrusively start a conversation with an influencer and get a chance to build those valuable long-term relationships in future. Free Bonus Download: Get your free PDF of successful cold email case studies and start ramping up your reply rates and conversions! Click here to download it for free right now! People talk a lot about what influencer marketing is, so I’m going to say what influencer marketing is not. Influencer marketing is not about paying popular Millennials to promote your product or service. People become influencers because they’ve managed to grow a large audience that trusts them. And since they don’t want to lose that trust, they won’t promote bad products, share poorly written articles or mention random people in their posts. So no, money is not everything. Industry experts are swamped with senseless offers, advertising, and spam. People ask them to share, to help, to advise. This is why they tend to ignore most of the messages they receive without even reading them. Most of the approaches I suggest here are based on doing the influencer a favor first, not asking them for a favor first, which will help them notice your message among all the others that are doing the opposite. Once you strike up a conversation, you’ll be able to start collaborating on some projects and building long-lasting relationships. People love sharing their experience and discussing things they’re passionate about or they’ve learned. Because influencers don’t have a lot of time, your offer to interview them as an expert is a great opportunity for them with very little work on their part. It’s best if you pitch some large publications and have a publishing contract or agreement in place first before asking experts to contribute. Without an agreement, you may end up unable to find an appropriate platform for publishing your interview. And asking influencers to take part in articles that never go live isn’t something that helps build strong relationships. So tell the influencer your idea and where you’re going to publish it. They are usually more than happy to contribute. Once your interview goes live, it will be much easier to ask your influencer for a favor or discuss some other ways to collaborate. 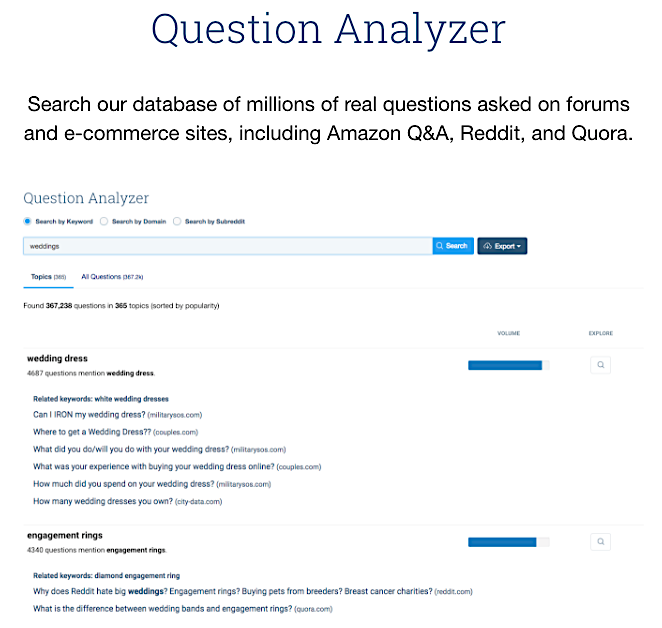 It gathers millions of questions from Q&A sites, e-commerce sites, and forums like Quora, Reddit and Amazon Q&A. Try searching for your main idea for the interview, look through the list, and grab the most exciting questions you’d like to ask your subject. Decide where you are going to publish this post (on your own blog or another platform). Add it to your editorial calendar or make an agreement with the other platform. Find influencers by using Mention, by searching LinkedIn, Facebook and Twitter communities, and by finding lists of industry experts on Google. Add influencers on LinkedIn, Facebook and Twitter, and follow them on other social media platforms to make it easier to reach out or follow up in future. Start reaching out to influencers! Send a personalized email explaining who you are, what you want, and what your idea is. I believe strongly that no one is so busy that they have no time to write “thanks, not interested.” So don’t give up after sending a single email and not getting a reply. Follow up at least two times if there is no response for 3-4 business days, and then try to reach out via LinkedIn/Facebook/Twitter, or the contact form on their site. But remember, don’t be too pushy and don’t write too often. Stop after 2-3 messages. The main idea of this approach is to offer a unique and exciting idea so that the influencer notices you in the email chaos. As I said earlier, influencers are swamped with messages from people asking them for a favor. If they helped everyone, they wouldn’t have time for anything else! So that’s why I offer the opposite approach: do a favor for them first. These ideas are easy to implement if you’re already a part of the professional community. Let’s admit it, almost everyone who writes for the Web dreams about being an influencer someday. If you want to find an influencer in your niche, you should always be in the community commenting and sharing influencers’ social media posts, their blog posts, and their articles on the leading publications in your niche. The thing is, if you’re a part of this community, you won’t have to fake your online presence. You’ll already naturally be commenting, sharing, and discussing. These steps will help let influencers know about you so that your name rings a bell when they see it in their inboxes. You can also help influencers find an error on his/her website to win their trust. The easiest way to do this is to use an SEO tool that allows site audits like Serpstat. This tool finds a wide range of errors in a matter of minutes, although for this approach we only need HTTP status code issues. Once you’ve launched a site audit to find 404 errors, the tool will show the number of such errors along with the locations and it gives recommendations on how to fix them. Once you have this info, let the blog or site owner know about the error on their page. Helping an influencer improve his/her site is a good way to start a partnership! “Hey Ben, I found out that the article on how to plan an effective content marketing strategy on your blog is returning a 404 error. Just wanted to let you know about this issue. To be honest, I was reading your blog as I was trying to find an idea for a guest post to offer you. And that topic from the broken page sounds like something I can cover. 🙂 What if I write an article on this topic so that you can update that broken page? Influencers usually have their own blogs, and pitching a high-quality article is a great way to start a relationship. If your idea is good and unique and your pitch doesn’t look like spam, you have a great chance of getting noticed by the influencer. While the wonderful idea for the guest post is up to you, I’ll give you some tips on how to create a personalized pitch. Since automation tools are smart enough to add a name automatically, you should enhance your personalization with a personal note. It could be anything that shows the influencer that you have done a little research before pitching. Use a tool like Serpstat or BuzzSumo to find the most shareable content on any blog or website. The ideas for personalization are endless – you just need to use your imagination a little. At the same time, you should keep your pitch as brief as possible. In fact, your pitch email should consist of a short introduction, a personal note, suggested topics for a guest post, and several writing samples (if necessary). So cut out the fluff and get straight to the point. As I said earlier, people love sharing their experience, but most influencers are too busy to talk to strangers and help newbies. That said, a few years (or decades!) back they were newbies, too. If you ask meaningful questions, some of them will respond, and it’s a great way to strike up a conversation and get the chance to collaborate in future. Write down several complex or difficult issues that only an experienced person could answer. Never ask something that everyone can find on Google! If you can’t think of anything, try looking on Quora or other relevant forums. Send a brief and polite message asking the influencer if they could help you out by answering a quick question(s). When Eric Siu, CEO of Single Grain and founder of Growth Everywhere, was first starting out, he used this exact strategy to learn from Neil Patel. Not only did he learn from an expert, but now they co-host the Marketing School podcast. “In the course of time that led up to Neil deciding to take Eric on as a mentee, Eric was constantly messaging Neil with short, to-the-point emails that contained sophisticated, non-basic questions – asking just one question at a time, making it easier for Neil to reply. The last approach I’m going to cover is mentioning influencers in your blog posts. In fact, you’re helping the influencer promote his/her blog, personal brand or service, so of course s/he would be happy to take a look at this post and share some feedback. Find influencers who are interested in your topic. To do this, you can use special tools, follow LinkedIn/Facebook communities, and follow influencers on Twitter. Find a way to mention them in your blog post. It could be a quote, a link to his/her post or research. Email the influencer and ask them to take a look at your post and share their feedback. If the post is good, an influencer can share it with his/her audience, and you’ll have something to talk about.